… opened its doors in Leumeah in July 2008. The culmination of Brian & Christerine Laul’s award-winning work with children globally and a “childhood obsession with all things Oz”. Their vision was to create magical experiences for children filled with hope and happiness in a venue where minds can develop, imaginations run riot and a family could have fun together. Today, Oz Funland stands out as a landmark in Sydney’s Macarthur Region, a community hub and multi-award winning small business. Its unique nature and the company’s passion for the local community even earned it an honourable mention in Parliament. Moving forward under the OZ FUNLAND brand, we are looking to take our special kind of children’s entertainment venue across Australia & then overseas. … in 1999 when Brian Laul wrote & directed The Wizard of Oz Show, a unique re-telling of Frank Baum’s classic story, at Sydney’s Independent Theatre. Today this highly interactive children’s show has been performed over 4,000 times around the world, represented Australia at global showcases and been acclaimed as one of the country’s leading children’s shows. The show (produced by Youngstars2.com) was even endorsed by Robert Baum, great grandson of Oz author Frank Baum: “If great-grandfather was alive, I’m sure he would be clapping, singing along and smiling with your show”. Invited to perform with the last living cast members of the 1939 MGM Oz film in America (2006).“I’ve seen lots of Oz productions but this one was truly extraordinary” – Margaret Pellegrini, Munchkin from the 1939 Judy Garland Oz movie. Selected by the Dept. of Foreign Affairs & Trade to represent Australia at the International Storytellers Festival, Delhi (2011) and partnered with the Australia-India Council and the Indian Government’s premier cultural force, the Indian Council for Cultural Relations.“A fun and unique work for children… leaves lasting memories and brings our countries closer.” – HE Peter Varghese AO, Australian High Commissioner to India. Part of the Sydney Children’s Festival (2012). … and understand how to creatively entertain them. Children in return have also enthusiastically embraced their offerings over the past 35 years. Their work has been the subject of media features, documentaries, even an entire chapter in the book Walkabout In Oz, publication sponsored by the Consulate General for Australia in South India (2012). …today demand more than just passive play, they realised that even the pay-for-play industry soon had to reach beyond current boundaries to remain relevant for the future. So they went about setting up an interactive ‘live’ space that seeks to engage its young visitors with creative activity and give them an unforgettable time of adventure, fun & discovery. Once more, the Lauls focused on innovation in entertainment and turned to Oz. 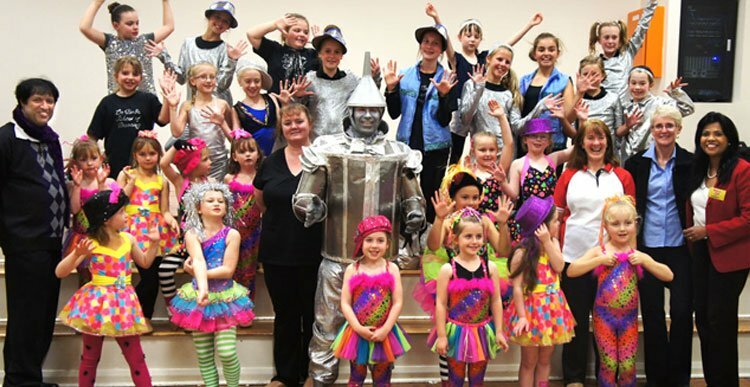 “The Wizard of Oz has all the ingredients to stimulate your imagination plus such a positive message of hope, mateship, self-esteem and self-empowerment so necessary for young people of today”, Brian Laul has said in countless TV, radio and media interviews. … is a unique, first-of-its-kind venue in Australia that is an exciting children’s entertainment, event and education centre. While children are walking through a magical land playing Putt Putt Golf, having fun in the playmaze, jumping castle, Oz Balladrome, doing craft or watching a show, parents can unwind at the Rainbow Cafe or browse lots of quirky Oz memorabilia on display. Parties for kids with themed characters and Educational Excursions for schools have become sought after specialities. Oz Funland’s vision is to enrich and support the local community by offering a fun and creative environment for the whole family. … lies at the core of Oz Funland. We support several community organisations, local hospitals, multicultural festivals, special needs and disability groups and actively participates in social awareness campaigns and community fund raisers. We are long term supporters of the 24 Hour Fight Against Cancer, a Macarthur-based organisation helping make a difference to cancer treatment and facilities in the area. … is passionate about encouraging local community initiatives and won the prestigious Champions of the West Tourism Award (2014) for its creative multicultural initiative Celebrate Campbelltown. …to enrich local communities around the world together with India Vision Institute’s visionary CEO Vinod Daniel, Brian created Ollie the Optometrist, a mascot to spearhead IVI’s eye care awareness program for children (2014). The company has also set up a partnership with India Vision Institute “to screen and provide spectacles to children”. Every fortnight, we proudly sponsor Good Morning Macarthur, a popular Facebook-based video show that tells local stories.